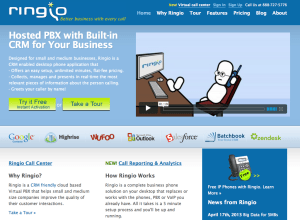 Ringio is a company that goes beyond what most other hosted PBX providers offer. The service not only handles your telecommunication needs, it also boasts a contact relationship management system that’s seamlessly integrates with its VoIP technology and software. The company aims on making call center technology and big data usage accessible to both small and medium-sized businesses in a scalable and cost efficient manner by leveraging the power of the cloud and integrations with other apps and services. Ringio offers custom virtual PBX call routing solutions, along with inbuilt CRM tools for effective communication management in small and medium scale businesses. Intelligent call routing services are the backbone of the company’s sound popularity in the industry. Ringio offers a host of useful and out-of-the-box features in their best-priced packages and deals, which most other service provider won’t be able to provide. Apart from the basic services, which include Caller ID, professional greeting, Call Routing, and Call Recording, Ringio extends its scope by displaying the information of clients you are talking to. Basic PBX features include: Optional local numbers, call collaboration and call routing, music on hold, customized greetings, mobile apps, built-in CRM, rest API, and many others. Setting up a virtual phone system with Ringio is quite easy. Like any other web application, you just need to sign up online and download the application to start making calls. When you receive a call from your client, you can have access to the full name of the client, his/her priority level, team member availability and the last person he/she spoke to within your business. All this data is made available in order to enhance the experience of the customers. Just like any other modern day PBX system, you need not scrutinize papers in order to get the information regarding the client. The team can easily share the contacts, status, call history, and much more through the application. The app can also be easily integrated with your smartphone. You don’t need to use your desktop every time in order to attend to your customers. With the help of the Ringio app for Android and iOS, you can easily redirect calls, deflect calls, review the client contacts, examine client notes and do much more on the go. 1-2 users cost equals to $49/month. 3 users cost turns out to $74/month. Cost for 4 users totals to $99/month. Every extra user after the 4th will cost $25/month. Special packages are available for plans having more than 10 users. Quarterly and annual billing comes with special discounts and deals. Under the call center plans, each seat will cost $59/month. With the help of rich user community support and professional video tutorials, Ringio aims at providing superior customer service to the users. A corporate blog, forums and videos are some of the other ways in which Ringio aims at providing the best support to its customers. ONE STAR for this review is being kind! I have a good sized company and made the mistake of changing from phonebooth.com over to Ringio because the CRM integration would of made my life alot easier….HUGE mistake. This phone service is not ready to be launched!!!! The Transfer and hold buttons do not work on your phones…have to hit * and # to release…guess what that doesnt work either! Call routing is terrible and IT DROPS CALLS CONSTANTLY. I think you actually have to dial from your computers keypad and not your phone…when you do …it just drops the call. Unlike phonebooth…if you have certain hours your open it still plays your incoming message…you know “1 for sales” etc….it doesnt have a “closed” message to route to. I have had it three days and trying to snap my porting back to Phonebooth which is super reliable. Also…all oversea’s support…that was the last straw. DONT DO IT!!! !